As it is Wednesday, it is also Copic Colour Challenge day! I think I picked the colours this week and for the first time ever, I actually enjoyed playing with them! Normally, I end up picking something random and then struggle. However, I'm stunned to say that this is one of my favourite cards that I have ever produced. I love it sooooo much! Paper: Just Chillin' by Making Memories. Copic Colours: E00, E11, E31, E33, E35, E37, E50, E51, E53, YG03, YG63, YG67, R20, R22, R81, R83, R85, YR07, YR23, Y17, Y21, BG15, BG34, BG49, W1, W3, W5, W7, B91, B93, B95, B97. Thats all from me, thanks for stopping by. Hope to get a chance to stop by your blogs tonight to say a quick hello! AWWW this is SOOOOO SWEET Stacey!! Fab colors and coloring..LOVE that image! It's GORGEOUS Steph! the colours are fabby! Congrats on your spotlight! I'm gonna go and check it out! Oooops! sorry Stacey! I think that I may have just called you Steph! Wow, so many colours.. and so beautifully used! Amazing colouring, gorgeous card. No wonder it is you favourite card it is beautiful. Colouring great and I love the DP's. Hope your well, thank you for your lovely comment. Gorgeous card as always, love those yummy papers. I love this as well Stacey, so not surprised you do too! Fab colours and love the tearing of the paper! Your LO is so simple yet stunning! Congrats on the Sugar Nlelie spotlight, you deserve it, your cards are always gorgoeus! Fabulous sweet card Stacey, gorgeous image and colours. I've been so pants at commenting lately Stacey, I'm really sorry! 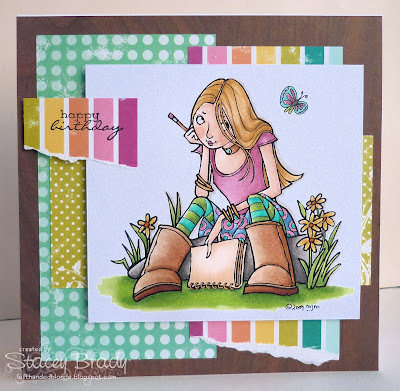 Your card is fabulous, I so love this image and the colours you've chosen are scrummy! Huge congrats on your SN spotlight too, woohoo! PS. Sorry about the previous comment.... my dd was signed in to blogger and I didn't realise, lol! soo gorgeous Stacey! I love this image and love her boots! great coloring as always! Ooooooh, love this Stacey - it's just...*sigh*...perfect! Really sweet, Stacey! And your colouring - amazing, as always!! Happy Sunday! Hope your weekend is good. So fun and cute Stacey!! Love all the dps you used!